Formed in 2013 by Matt Couto (Elder), Darryl Shepard (Black Pyramid, The Scimitar) and Tom Corino (Rozamov) – after the trio spent time jamming together in-between day-to-day commitments – the doom supergroup KIND quickly cemented their formation with the addition of Roadsaw vocalist Craig Riggs. Out of the mind-bending riffs and extended jam sessions, whole songs began to take shape through winter rehearsals down in Couto’s freezing cold basement in 2104, where the newly formed quartet began laying down ideas for their soon to be released debut, Rocket Science, which officially lands this December on Ripple Music. Shows were soon booked to share the tunes with the curious. Further riffs materialized, new songs banged into shape, and yet more shows confirmed, so keen were the band to test their mettle and mixture of heavy metal, psych, Krautrock and straight-up, classic rock and roll. 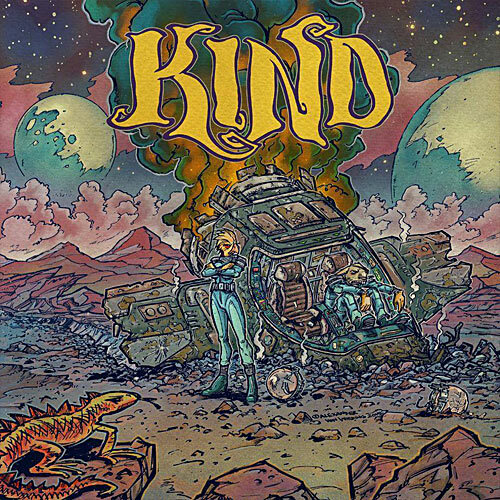 With four songs recorded at Mad Oak Studios serving as the band’s demo, in the spring of 2015, KIND entered New Alliance Studios with engineer Alec Rodriguez to record their first full-length, Rocket Science which will receive an official release this December on the California-based label Ripple Music.